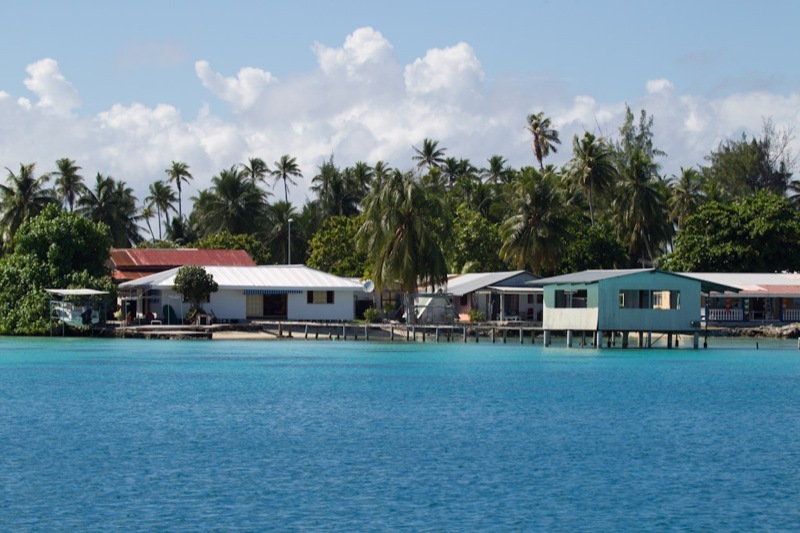 We're at anchor in front of the village of Rotoava, on the north-east corner of the Fatarava atoll. Our first atoll! Yesterday wasn't very nice sailing at all (again) - Wind 20kn on the nose, frequent rain, and chopped up waves - and so we're glad to be at anchor now. And today is looking to be a wonderful day. Sunny and light winds form the E/NE, just perfect for sailing on our old course. Well, we're here now. No more working the sails in the rain while desperately holding on to a wildly rocking boat. The adventure is over for a while, now we can relax. Liz is already back asleep ;-). The interesting, because new, part was crossing through the pass of the atoll this morning. The atolls here are basically a large circular reef, with only a few passes. Fakarava is one of the largest atolls with a length of 30nm, and two passes. Through these passes the tide has to come in and out, and depending on the size of the atoll that is a lot of water. Which means a lot of current. Get your times wrong and you get stuck in the pass, or worse, get pushed onto the reef. So the key thing is to start the entry or exit in time with slack water or a favorable current. We timed the arrival at the pass to 1.5h before high tide. That gave us still 1kn of current in our favor. Nice, but not too much to risk being pushed somewhere we don't want to go. The current can be up to 6kn. The pass here in Fakarava is huge, a couple of 100m wide, and 10m to 20m deep. Very good for first-timers like us. Incidentally the "Aranui 3" went through the pass just ahead of us, nice. I use mostly the program <a href="http://wxtide32.com"; target="new">WxTide</a>, or the Navionics Gold charts to view tide tables. The <a href="http://www.shom.fr"; target="new">service hydrographique et oceanographique de la marine</a> website also has tide tables for the French Polynesia. The data from the institute matched WxTide, my charts don't have data for the Tuamotos.